Crepe Pan are traditionally made of cast iron. 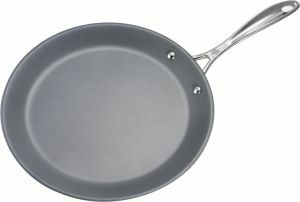 They have a low rim and a long handle which ensures the pan can be held and the Crepe tossed with control. Cast iron pans should be seasoned with salt to prevent sticking and oiled to prevent rusting. The new non stick pans achieve the same result.